The SEMA Show is all about innovation and creativity. For a taste of what’s coming at the 2014 event, check out the more than 70 new products previewed here. During the Show on November 4–7, 2014, head to the upper level of South Hall for a look at the New Products Showcase in the Las Vegas Convention Center. Back in July, my team and I had the opportunity to meet with the SEMA council leadership at its annual Council Summit in Pomona. We were invited to join the meeting to talk about the SEMA Data Co-op (SDC) and get feedback from this diverse gathering. What was particularly fascinating was that this group—made up of smart folks who do a great job of running their businesses—had widely varying understandings (and thus opinions) about product data management. After an hour of very productive discussion, the entire room merged onto the same page, and we came away with a group that was better able to relate product data management to their individual businesses while helping us at the SDC to realize that a lot of hand-to-hand education still needs to happen. If you’re not registered to participate in the SEMA Ignited event, now is the time to get in. The event concept is simple. After four days behind closed doors in the Las Vegas Convention Center, visible only to industry professionals, participating cars and trucks from the SEMA Show will roll out on Friday, November 7, to assemble at one of the newest landmarks in the city, the High Roller observation wheel at the LINQ entertainment district. There, from 4:00 p.m.–10:00 p.m., consumers and the media will be able to experience the hottest cars, products and personalities from the SEMA Show and enjoy food and music in a culminating celebration. Participation in the event will be free of charge to SEMA exhibitors, attendees and consumers. With nearly 20 years in the production of both consumer and trade automotive events, the SEMA Show’s Tom Gattuso is well versed in ensuring that attendees and exhibitors receive the greatest return on their investments. He holds a certification in event management, and the 2014 SEMA Show will be his fourth as its director. SEMA News was pleased to talk with him about the Show, its features and his expectations for this year’s venue. The SEMA Show is a business event, as everyone in the industry knows. It’s the venue where buyers and sellers come together to provide products to installers and stock the shelves of retail outlets throughout the nation and the world. But it’s also so much more than that. It’s one of the world’s greatest custom car shows. It’s a four-day university of automotive knowledge. It’s a carnival, complete with wild rides and sideshows. There’s more going on at the SEMA Show than at many of the planet’s amusement parks, and there’s only so much time in each day. Attendees have to plan ahead if they want to catch every nuance available. Here’s a brief look at some of the major points of interest. On July 11, 2014, SEMA members joined with SEMA staff and thousands of enthusiasts to celebrate the fifth annual Collector Car Appreciation Day (CCAD). A wide range of official events were held in the United States, Canada and Australia to commemorate the day, designated by SEMA-requested U.S. Senate Resolution 493, which was sponsored by Senator Jon Tester (D-MT), Senator Richard Burr (R-NC) and Senator Mark Begich (D-AK). The U.S. Senate Resolution recognized “that the collection and restoration of historic and classic cars is an important part of preserving the technological achievements and cultural heritage of the United States.” Lawmakers in states, counties and local areas all over the country and Canada followed the Senate’s lead. The states of California, Louisiana and New Mexico, along with the Canadian Provinces of British Columbia, Manitoba and Nova Scotia, adopted their own resolutions commemorating the day. According to a report entitled “2013 SEMA Show Research”—a post-Show survey of exhibitors and attendees—almost 90% of exhibitors at the 2013 SEMA Show said that they exhibit in order to generate leads and increase awareness of their companies. Slightly higher percentages said that those objectives were met at the 2013 Show. 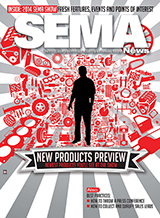 Breaking news from SEMA member companies, including Hastings Manufacturing, J&L Marketing, Flaming River Industries, Kit Car Builder, The Hybrid Shop, Drake Automotive Group and more. Prior to the official opening of the 2014 SEMA Show, members of the media can get a head start on coverage by attending the Light-Truck Accessory Alliance (LTAA) Media Preview. Registered and credentialed journalists can attend the first-ever pre-Show media event and avoid the rush of 60,000 buyers to get a sneak peek at some of the newest parts and accessories for the truck and SUV segment. 3M has challenged all graphics experts to showcase their talents using 3M Wrap Film Series 1080 and face off in the Wrap2Wrap Battle. Installers began competing in online knockout rounds in August, and two finalists will go head-to-head, Thursday, November 6, at the 2014 SEMA Show. Digital Lizard is offering 2014 SEMA Show exhibitors and attendees 20%–50% off of printed materials. As an official SEMA Show partner, Showgoers will benefit from lowered costs and on-site customer service at the Show. The SEMA Garage is officially open and ready for business. After months of planning and renovation, SEMA recently held a party to introduce the SEMA Garage to the automotive industry. Many were able to see firsthand such features of the Garage as the photo cove, 3-D printer, training center and emissions lab. The Garage has been so well received and generated such interest that media from New York to Los Angeles are taking notice, and the SEMA Garage is making headlines.